Another set of recipes in our trying-to-keep-it-light, post-holiday trend… I made this stew from Veganomicon and Lisa made an awesome cornbread adapted from a recipe @ 101 Cookbooks. The chili has too many green vegetables to count, plus Granny Smith apples! The cornbread had a nice little kick that went really well with the chili. Well yeah, it’s a *little* sweet… there’s apples in it. But it’s not overly so. There’s a lot going on. You’re right… I’m adding a little bit of salt to mine. The cornbread is awesome. Those peppers in it keep it pretty moist — I don’t need to slather my piece with butter. Hm, I *really* like this chili, it’s growing on me with every bite. That Kermit was full of it — seems like it’s pretty easy being green. Place the chopped potatoes in a small saucepan, cover with water, and bring to a boil. Let boil, covered, for a little less than 20 minutes, until the potatoes are easily pierced with a fork. Drain and set aside. Meanwhile, heat a large pot over medium-high heat. Saute the onion, jalapeños, and poblanos in oil for about 10 minutes, until everything is softened and the onions are slightly browned. Add the garlic, cumin, oregano, and salt. Saute for 1 more minute, until the garlic is fragrant. Add the white wine and tomatillos, raise the heat a bit to let the wine reduce and the tomatillos release their juices, about 5 minutes. Add the apples, vegetable broth, scallions, and 1/2 cup of the cilantro. Lower the heat to a simmer, cover, and cook for 20 minutes. Use an immersion blender to partially puree everything, or transfer half the chili to a food processor and puree, then return to the pot. Taste for tartness: if bitter, add a teaspoon or two of sugar to level things out. Add the cooked potatoes and the beans, simmer for a few more minutes, until everything is heated through. Add the remaining cilantro and the lime juice. 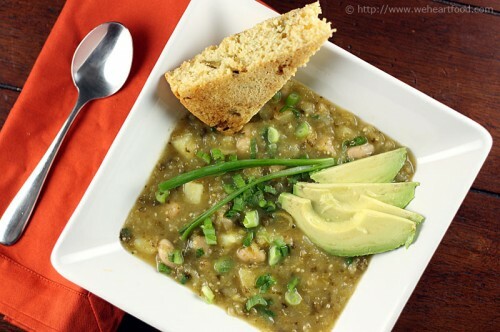 Ladle into bowls, garnish with the avocado and scallions, and serve. Preheat your oven to 350F degrees, with a rack in the middle. Just before you make the batter, in a small saucepan, melt the butter, stir in the red pepper flakes, and pour into a 9-inch pie tin or baking dish. Place in the hot oven. In a medium bowl whisk together the flour, cornmeal, sugar, baking powder and salt. In a separate bowl whisk together the almond milk, egg, and chilies. Pour the wet ingredients over the dry and stir until just combined. Now very carefully remove the hot pan with butter from the oven. Fill it with the cornbread batter, pushing the batter out to the sides if needed. Bake for 30 – 40 minutes or until the edges are golden and the center is just set. 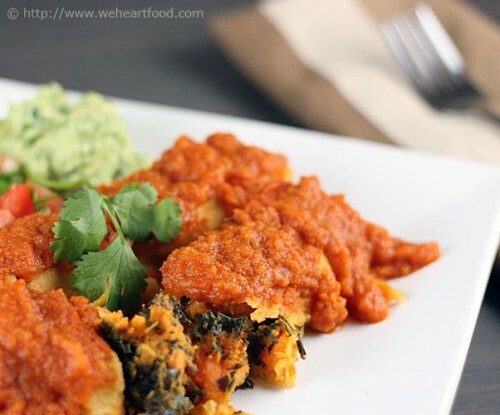 We’re trying to eat lighter meals now that we’re back from vacation, and this one from Super Natural Cooking seemed to be on the lighter side, yet filling. Rather than arborio rice, this risotto uses pearl barley, and get its citrusy flavor from lemon zest and grapefruit. I actually think it could use a little more flavor — maybe next time I’ll use chicken or veggie broth instead of the water and a little more wine. I’m always on board for more wine! I do like that she’s pretty accurate with the number of servings for recipes in her book. This would also work well as a side to something else. I’m enjoying it okay, but I want something else with it. I’m not sure I’d make it again as a main course. Maybe next time we’ll try the barley risotto recipe I found with pancetta — should be a lot of flavor in that one! Heat the oil in a large dutch oven over medium heat, then add the onion, shallots, garlic, and salt and saute, stirring constantly, for about 4 minutes, or until the onion begins to soften. Add the barley and stir until totally coated. Add the white wine and simmer 3 or 4 minutes, until the barley has absorbed the liquid a bit. Adjust the heat to maintain a simmer. In stages, add about 6 cups of water, 1 cup at a time, letting the barley absorb most of the liquid between additions; this should take around 40 minutes altogether. Stir regularly so the grains on the bottom of the pan don’t scorch, and continue until the barley is cooked through and tender-chewy. Meanwhile, grate the zest of the grapefruit, then peel and cut the grapefruit into segments. Cut the segments in half, reserving any juice that leaks out. 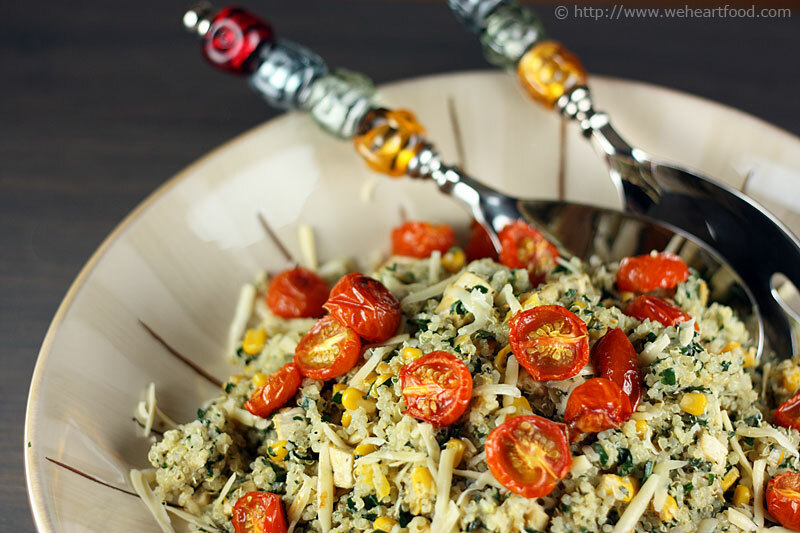 When the barley is tender, stir in the zest, segments and juice, Parmesan, and sour cream. Taste and adjust the seasoning, then stir in the arugula. 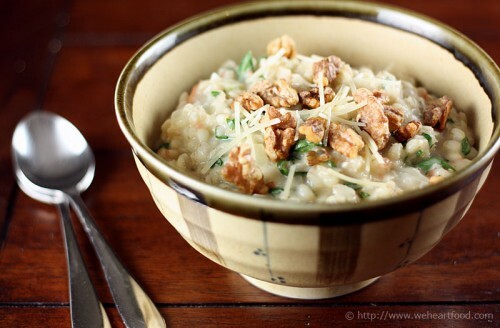 Garnish with the toasted walnuts before serving. 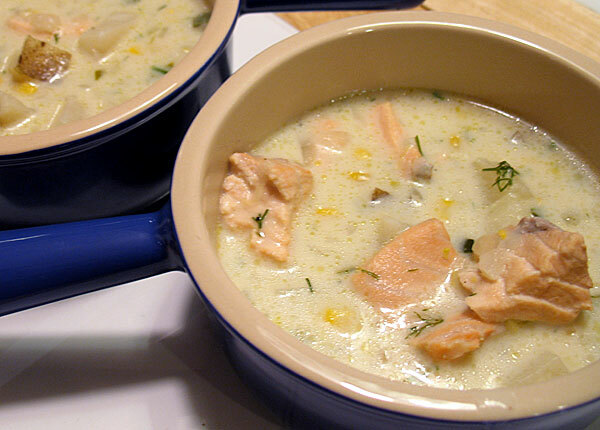 A very special guest post this evening from Lisa’s brother Chris (yes, another Chris…) and his girlfriend Jenn — a delicious Salmon Chowder from The Ultimate Soup Bible . C&J made an enormous cauldron of the chowder that fed nine or ten lucky souls over the course of two nights. I only had my point-and-shoot camera with me, so I wasn’t able to get as good a picture of the chowder as I normally would — guess, we’ll just have to make it ourselves! (As if we really needed an excuse…) We served the chowder with a few sides and salads we’ve made before, including these roasted yams, a salad featuring arugula and roasted bell peppers, and one featuring layered beets and avocados. This is wonderful, who made this? I really like that the broth isn’t super-thick like in a lot of chowders. Oooh, I like the corn in this. Good addition! The dill is great — perfect amount. Melt the butter in a large pan. Add the onion, leek, and fennel and cook for 6 minutes until softened. Stir in the flour and reduce the heat to low. Cook for 3 minutes, stirring occasionally with a wooden spoon. Add the chicken stock and potatoes to the mixture in the pan. Season with a little salt and black pepper. Bring to a boil, then reduce the heat , cover, and simmer for 20 minutes or until the potatoes are tender. Add the salmon and simmer gently 3-5 minutes until just cooked. Stir in the corn, milk, cream, and chopped dill into the pan. Cook until just warmed through, stirring occasionally. Do not boil. To thicken, smash some of the potatoes against the side of the pot. Adjust the seasoning to taste, then ladle into warm bowls.